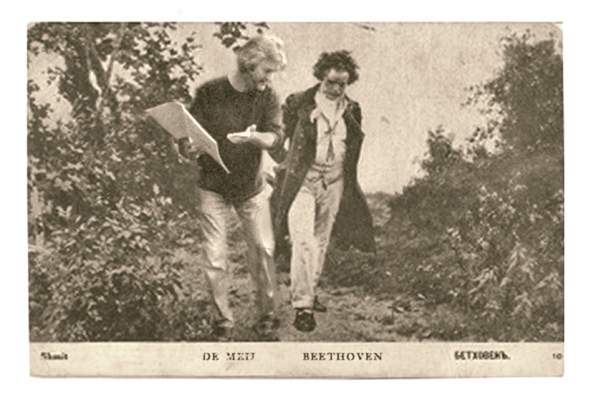 Beethoven and De Meij spent many hours on discussing the score. Extreme Beethoven is based on a similar concept as its illustrious predecessor, Extreme Makeover. A well-known classical theme is first presented in its original form, and then subtle and surprising shifts start to creep in. Various other Beethovenian motifs also make their appearance. Starting with the opening theme (from the second movement of his Piano Concerto No. 5, the Emperor Concerto), Beethoven’s vast treasure trove of wondrous themes and motifs are put to good use. Melodies are quoted, enlarged, condensed, repeated in minimalist patterns, counterpointed, or placed in an entirely different context. It is as if listeners can cast a glance into the genius brain of the master. Inside, a multitude of ideas and motifs tumble over each other. Some are dreamlike and exquisite, others nightmarish, frightening, and obstinately repetitive. The nine symphonies provide the majority of the material for Extreme Beethoven, but themes from the Egmont Overture, theMoonlight Sonata, Für Elise, and theTurkish March have also been woven into the patchwork of quotations and references. Halfway through the piece, a small ensemble creates some indispensible musical confusion, worthy of Charles Ives – two groups playing on top of each other. A quotation from the Finale of Egmont morphs into a jazzy ostinato bass line until the pile-up of eight notes forms a bizarre cluster. What amounts to an ‘Egmont groove’ fits amazingly well underneath various other quotations. That brings us to the finale, where the Emperor theme resumes, played by the entire orchestra. Undoubtedly, purists and musicologists will scratch their heads on hearing this music. Please understand that the piece springs from intense admiration and respect for one of the greatest composers of all times. 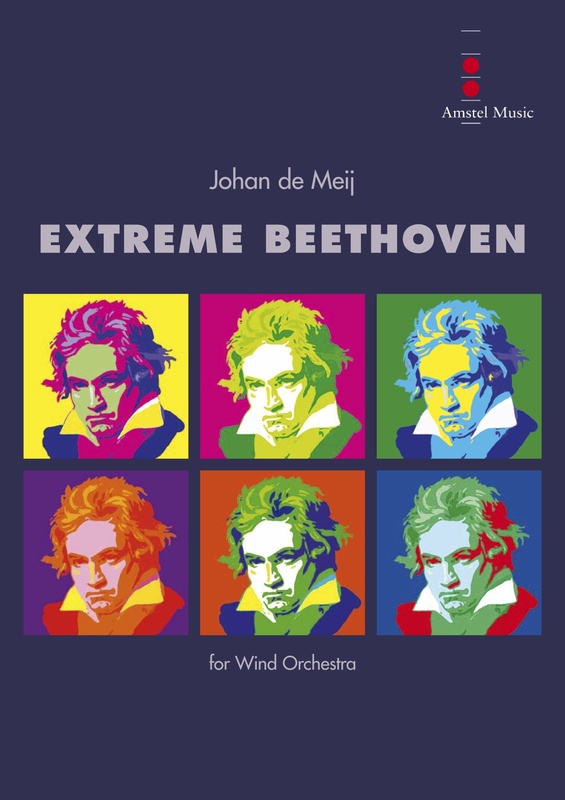 Above all, Extreme Beethoven is an ode to the greatness of Ludwig van Beethoven. * The small ensemble (the Banda) enters halfway through the piece, either from backstage or from the back of the auditorium, depending on the available space in the venue. The Banda plays at a higher tempo and in a different key than the orchestra, led by the percussion section. The conductor stays with the orchestra and conducts the brass, contrabass, and timpani in Tempo 60. Flutes, clarinets, and piano repeat their most recent pattern as they slow down, independent of the conductor, until a few bars before 314. As it continues to play, the Banda walks to the stage, thus creating a natural crescendo before taking up position next to the orchestra. Beginning at bar 314, the conductor coordinates both ensembles. For a while, they play amicably together. From bar 353 onwards, the Banda stops playing, then turns around to march off, roughly at bar 362. This does not have to be exactly on the bar line. Once again, the percussion section takes the lead; it strikes up in a slightly higher tempo in order to play the Turkish March. Moving backstage, the Banda disappears from sight and out of earshot, thus creating a natural fadeout. Subsequently, the musicians take their place in the orchestra as quietly as possible. * Additional parts are available for the Banda, which consists of 2 piccolos, 2 cornets, 2 trombones, and 3 percussionists. The sheet music can be clipped onto a lyre, or the players may eventually prefer to memorize their parts.